Store it in style with a multi purpose Activity Table. I have been searching for the perfect table to house my youngest child’s collection of Lego, Matchbox cars and various other treasures for so long I had very nearly given up. That is until I saw the extremely dashing and multi purpose table you see here before your very eyes. The Arts and Crafts Activity Table from Hip Kids ticks all the boxes on my list of table specifications at such break-neck speed I can hardly contain my excitement. This modern and sleek design has a beautiful deep storage drawer that fits snugly within the table but can be wheeled out on castors if need be. The reversible lid, with its smooth white surface and a chalkboard finish on the underside, comes off to reveal a whole new storage area. Bliss! Generously sized at 94 x 72 centimetres, there is more than enough room for a drawing crowd to share. 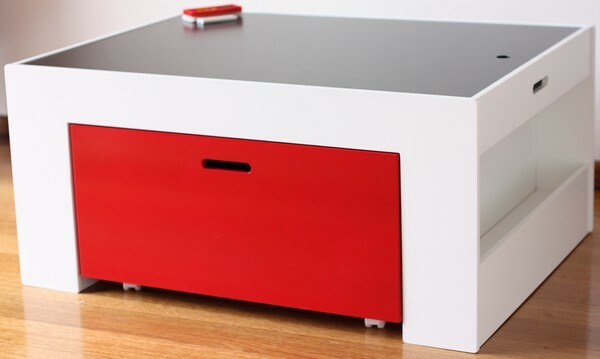 Hip Kids use non toxic, lead free paint and the Activity Arts and Craft Table is available in white with a white, red, blue or pink storage drawer. Shelving on the sides of the table are perfect for holding pens, pencils and notepads or your child’s favourite books. The Activity Arts and Craft Table is $169 from Hip Kids.